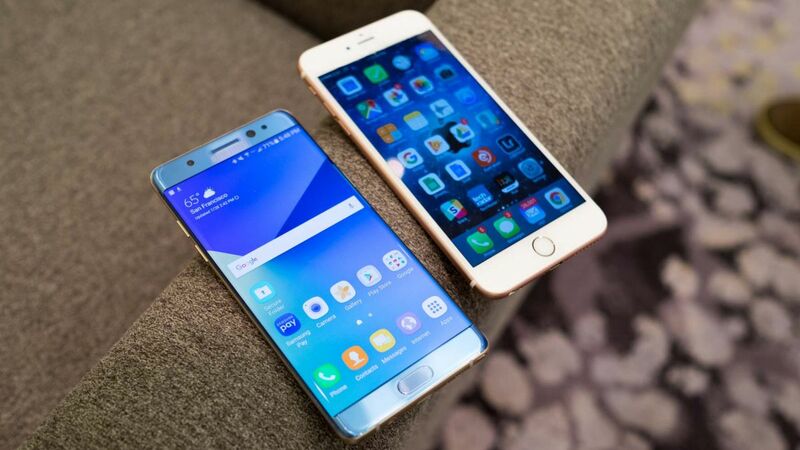 Home Galaxy Note 7 New Galaxy Note Phone vs Apple’s Flagship Phablet: Which is the best one? The Galaxy Note 7 is Samsung’s new Galaxy Note phone. On the other hand, the iPhone 6S Plus is Apple’s flagship phablet. Both of them incredibly powerful and gorgeous. But which can be regarded as the best one? You will find the answer to this question at the end of the article. But first, let’s take a detailed comparison between the two phablets. The Galaxy Note 7 has a thickness of only 7.9mm. It comes with the new Corning Gorilla Glass 5 on both sides. As a result, the device has become tougher than ever before. On top of that, it is IP68 certified. That means, it is water and dust resistant. The S-Pen also comes with the same rating. On the other hand, the iPhone 6S Plus comes with a thickness of only 7.3mm, which makes it slimmer than its competitor. Being constructed with metal, it’s more durable. However, it is not water and dust resistant, which is definitely a big negative factor. The new Galaxy Note 7 has a large 5.7-inch Quad HD display. Having a high pixel density of 518 ppi, it is able to create a more stunning view than all the phablet displays on the market. Moreover, its Super AMOLED panel makes the blacks deeper and colors brighter. The iPhone 6S Plus has a slightly smaller 5.5-inch Full-HD display. It also has a lower pixel density of 401 ppi. As a result, it cannot produce the same stunning view as the new Galaxy Note phone display. The dual-pixel technology has made the shooters of the Galaxy Note 5 the best ones in the current market. Its sensors are larger than its predecessor. Its autofocus is faster than ever before. Moreover, it shows an amazing performance in the low light environment. While the shooters of iPhoen 6S are really great, they fail to outperform the shooters of the new Galaxy Note phone. The Galaxy Note 7 has been equipped with the Exynos 8890 processor, 4 GB RAM and Mali-T880 MP12 GPU. In the AnTuTu benchmark test, it scores 116036.33 points, which is absolutely fantastic. The iPhone 6S Plus has been packed with the Apple A9 processor, 2 GB RAM and PowerVR GT7600 GPU. In the same test, it scores 58664 points, which is way less than the score of the new Galaxy Note phone. Coupled with the AMOLED display, the 3500 mAh battery is able to last longer than the iPhone 6S Plus. It has an outstanding endurance rating of 90 hours. On the other hand, the endurance rating of the battery of Apple’s flagship smartphone is 85 hours, which is slightly less than its competitor. However, it doesn’t support the fast charging and wireless charging technologies as the battery of the Galaxy Note 7. Being slimmer than the Galaxy Note 7, the iPhone 6S Plus looks a bit better. But when you consider other factors, like the performance of the display, camera, hardware and battery, you will find that the new Galaxy Note phone is way better than Apple’s flagship phablet. So, it’s safe to say that the real winner is Galaxy Note 7. Do you agree that the new Galaxy Note phone is better than Apple’s flagship phablet? Share your thoughts by hitting the comment button.